Should you invest in clubs or lessons? Deciding on where you should allocate your funds to enhance your golfing enjoyment can be one of the trickiest things to do. Do you invest in the latest and greatest equipment fitted to your personal technique, or do you opt for a package of lessons? Hopefully I can shed some light on the subject from a Golf Professionals’ perspective, and help build some awareness for the common golfer. Here is my short answer. Are you mostly content with your current level of play? Are your best shots going the distance, height and direction you feel are at the maximum of your physical capabilities? If you answered yes, then you would be in a good place to invest in clubs. If you answered no to either of those questions, then the lesson route (or self-education) is the way to go. The easiest way I can explain making the choice is simple. If you want to raise your “ceiling” in golf, you have to make a change or practice more, but in order for practice to be effective you have to know how and what to work on. If you want to reach the ceiling of your current ability, then a new set of fitted equipment can help you maximize your CURRENT potential. Now, there are some exceptions to this. If you’re a young junior using dads set of stiff-shafted full-length bladed clubs, or a person of extremely tall stature then yes, a properly fitted set of clubs are going to make a real difference right away with your ability to develop as a competent golfer. Another example, I’ve worked with some older players that have up to a 3 iron with steel shafts, in this case it may make more sense to have lighter graphite shafts in a hybrid set that would help with your speed and impact. I’ve seen several cases of juniors in camp, and ladies in clinics that use their dads/husbands’ set of clubs and it looks like the club is swinging them as opposed to other way around. There’s a phrase that was made famous by both Ben Hogan and Lee Trevino. “You just have to dig it out of the dirt”. A common misconception is that you have to play and practice golf as a full time job in order to break par. While I’m not going to say this is a game that’s particularly easy to improve at. There are much faster ways to improve than sitting on the range 3x per week and hitting golf balls without a target in an effort to “find something”. I see it all the time. ​That brings me to lessons, do you need them to get better? Absolutely not. All golfers have a pattern in which they move the golf club, I’ve worked with beginners that have excellent and functional patterns, they need little assistance and develop extremely quick. It may be uncommon, but it does happen. The vast majority are not in this group and in order for them to truly improve their game, they either need help from an instructor, or some education on the physics and kinetics of what makes good golfers good, and the ability to apply that education. I can promise you, if Lee Trevino or Ben Hogan had access to a high-speed camera they would have used it. They wouldn’t have had to dig up as much dirt to achieve their goals. Back to club fitting, in my short answer I asked you a couple of questions. These questions don’t have a right answer, if you are comfortable with your level of play and you’re looking for a slight boost in distance, accuracy and help on mishits then a properly fitted set of clubs is right for you! If you’re looking to improve your ceiling and want to get to a level you’re content with, then lessons would be a good place to start before investing in new equipment. set that generally matches your skill and ability. From there, I would suggest taking lessons or practicing until you reach a level of golf that you are content with. Then, a fitted set of clubs should last you essentially until they wear out or become obsolete (which takes much longer than most would think). Hopefully this information helps you make an educated decision this spring! If you’d like to chat more about these points or if you’re looking for more information I can be reached at cmcclure@clublink.ca. It’s finally that time of year again, Golf season is here! Myself, and fellow Rattlesnake Golf Professionals Brian Cvetkovic and Bryan Overland had the opportunity to play Hidden Lake Golf Club this past Monday. ...it was great to get out on the course and enjoy the sun for the first time this season! Going into the round we were all excited to see the ball get into the air as opposed to going into a net. A special thank you goes to the team at Hidden Lake for getting their course ready for our members to enjoy. If you’re like me, you’ve spent all winter thinking about how you can save strokes out on the golf course, or perhaps planning out your new ‘catch-phrase’ for when you outdrive the other members of your weekend foursome. One of the best parts about playing golf is that you can always improve your technique and strategy, if you have some extra time to hone your game at our practice facility or would like to see how you can manage your game best on the golf course, the professionals at Rattlesnake are always here to assist you. Do you have a child or a grandchild that has expressed an interest in golf? Our rebranded Golf Academy has a strong emphasis on getting children into the game! We have weekly programs and camps spread throughout the season, so whatever your schedule, we have an option that will work for you. Opening day at Rattlesnake is upon us and I am looking forward to seeing all of our members and guests at the club this weekend. To see additional clips of our day at Hidden Lake and a special cameo appearance of one of our own Rattlesnake members, please visit “McClureGolf” on Instagram! MILTON, ON -- The PGA of Canada - Ontario Zone capped off their 2017 tournament schedule yesterday at Glencairn Golf Club with the Levelwear Fall Scramble. The Fall Scramble is a three-player team event and is without a doubt the lowest scoring and most widely contested event of the year. Levelwear Golf was on site sweetening the deal with tee gifts for all the players and generously supporting all the teams going head-to-head for the purse which measured over $17,000. Feathers were flying as every team in the sold-out tournament was under-par and twelve of those teams were ten-under or better. It was the team of Brian Cvetkovic (Rattlesnake Golf Club), Bryan Overland (Rattlesnake Point Golf Club), and Chris McClure (Rattlesnake Point Golf Club) who elevated their game, relied on a dominant putting performance and finished the round with thirteen birdies and an eagle on their way to a fifteen-under 57. "Matching shirts was the key," the trio joked after the round. "You don't win an event like this if you don't all play well," Cvetkovic continued. "We used a lot of Chris' drives and Bryan's drives, and coming into the green all three of us were contributing. Even when it looked like we were down and out and we needed a big putt to keep the round going there was always that last guy who would step up and drain it. It definitely came down to putting. The greens were really pure, and if you hit your line the ball was going to go in." The three guys played a practice round earlier in the week and it paid off. They took that extra little bit of course knowledge and put it to the test. "You absolutely need to find the fairway if you want to score well here," McClure added. "Most importantly, be aware of where the escarpment is or you will start second guessing yourself on the break. If you just base it off of where the escarpment is and trust your reads you can make some very key putts at key times." 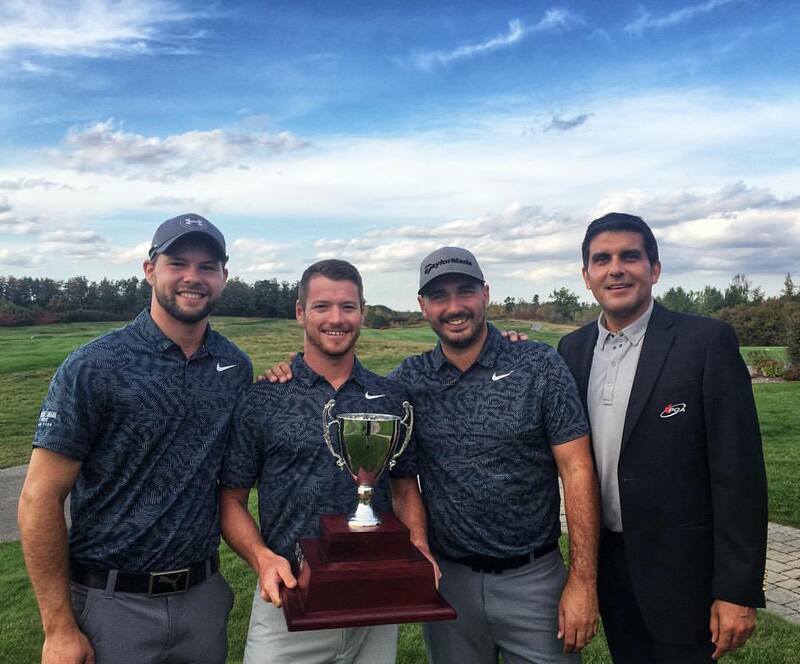 The teams of Jim Currie/Nick Maracle/Curtis Pitre, Chris Hatch/Andrew McCarthy/Luke Pulla, Bill Mackenzie/John Rushnell/Rick Willan, and Kyle Docherty/Tyler Fitzgerald/Cameron Gall all finished two-back of the winning trio at 13-under 59 and nicely rounded out the top five.